Capable of being outfitted with equipment you wouldn’t find in your average food truck, Legion food service custom trailers and mobile kitchens can be equipped with large ranges, stoves, grills, fryers, smokers and even ice makers that allow it to prepare a wider variety of menu items and offer superior versatility for high volume events. Every Legion food trucks is uniquely designed to suit its owners individual needs. Each customers has direct input in not only determining their equipment selection but also in determining the amount of storage, shelving and refrigeration that will be available on their food truck. By eliminating “cookie-cutter” designs and utilizing such things as a wide range of equipment options, as well as, ample storage, full size commercial refrigerators and even soda fountains, Legion food trucks are not only the most unique but also the most functional food trucks on the market. 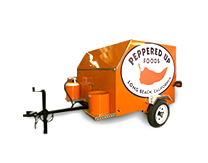 Legion food trucks incorporate commercial cooking equipment produced by top manufacturers such as Wolf, American Range, True, Beverage-Air, Randell, and Fry-Master among many others. 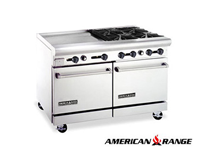 By allowing each customer to individually select their equipment choices, Legion has acquired vast experience with commercial cooking equipment. Due to this, Legion only utilizes quality cooking equipment that is robust and durable. This ensures that downtime for repairs is kept to a minimum. Through the use of quality components and equipment Legion is able to keep their customers out of the shop and on the road. 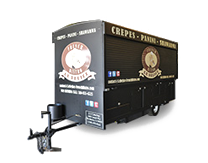 Legion food trucks can incorporate a number of different technologies that not only allow Legion food trucks to stand out but that also facilitate its sales. 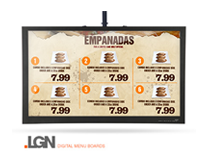 Through the use of LCD screens, digital menu boards, WiFi, POS systems, LED lighting and even Mobile DirecTV, Legion food trucks are the most technologically complete food trucks available. Through incorporating most of the amenities customers traditionally see in restaurants, Legion food truck owners can offer their customers a more unique and complete dining experience. Possibly one of the most overlooked components, the generator is the heart of every food truck. 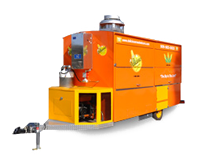 Responsible for powering your lights, refrigerators, pumps and equipment, a powerful and reliable, yet quiet generator is crucial for any successful food truck operation. 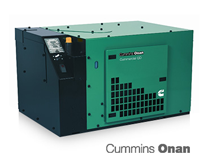 Legion strongly recommends the use of Cummins-Onan, Honda or Power-Tech generators only. By using reliable, quiet generators, food truck owners can avoid unnecessary down-time, as well as avoid losing customers through excessive noise pollution produced by low-end generators.